Happy 2019 everyone! 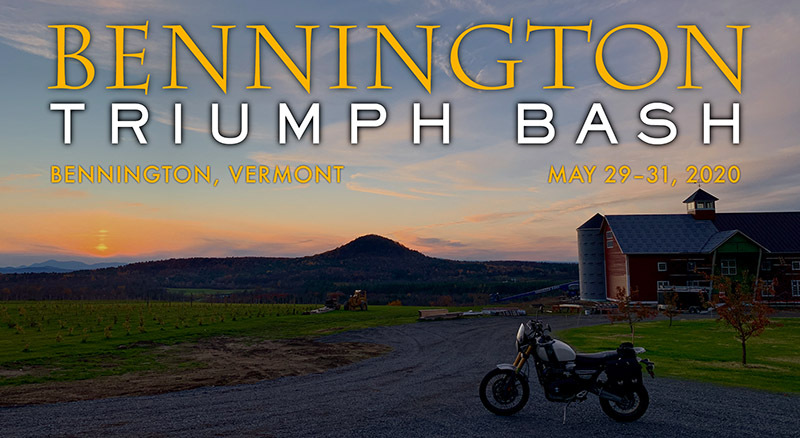 It’s time for the Twelfth Annual Bennington Triumph Bash! Now in our second decade, we’ve gone this long as a grassroots, independent rally for Triumph motorcycle owners by Triumph motorcycle owners, and we have a great time every year. This website is the information clearinghouse for the BTB. The twelfth annual event will be held Friday, May 31, to Sunday, June 2, 2019. Please check back frequently for information updates. Use the navigation at the top of the page to get around the site. Thanks for reading, and we hope to see you in Bennington! Please note: we will need people to preregister for the Friday and Saturday dinners so that the vendors can prepare the right amount of food. Please see the Dinner page for more details. For all lawyers whom it may concern: This event is free. It is an informal get-together of friends and like-minded souls; no profit is generated. Triumph Motorcycles is not the organizer of this event. All people attending should already understand the risks inherent to motorcycling, and they must be willing to accept those risks. The organizers of this event are not liable for any accidents that may (but hopefully won’t) occur.